This post is going to be a major link dump. Please visit all the links I post here by visiting the sites to get the fuller picture. After the first week of euphoria wherein the western press was at pains whether to describe what happened in Egypt as coup or not, information and news is finally coming out of Egypt that how it was a long planned coup executed through naive and glassy eyed young educated revolutionaries of Tamarrod who failed to see that Egypt had become a #CoupCoupLand. I did mention some theories in my earlier post ( Egypt Coup : Engineered by military and supported by elite and West) that how the coup seems to be engineered. Whereas the previous post focused more on definition of coup and theories, this one will comprise of evidences. Working behind the scenes, members of the old establishment, some of them close to Mr. Mubarak and the country’s top generals, also helped finance, advise and organize those determined to topple the Islamist leadership, including Naguib Sawiris, a billionaire and an outspoken foe of the Brotherhood; Tahani el-Gebali, a former judge on the Supreme Constitutional Court who is close to the ruling generals; and Shawki al-Sayed, a legal adviser to Ahmed Shafik, Mr. Mubarak’s last prime minister, who lost the presidential race to Mr. Morsi.But it is the police returning to the streets that offers the most blatant sign that the institutions once loyal to Mr. Mubarak held back while Mr. Morsi was in power. Throughout his one-year tenure, Mr. Morsi struggled to appease the police, even alienating his own supporters rather than trying to overhaul the Interior Ministry. But as crime increased and traffic clogged roads — undermining not only the quality of life, but the economy — the police refused to deploy fully. Ms. Gebali, the former judge, said in a telephone interview on Wednesday that she and other legal experts helped tamarrod create its strategy to appeal directly to the military to oust Mr. Morsi and pass the interim presidency to the chief of the constitutional court. Ahmed Nabawi, a gas station manager, said he had heard several reasons for the gas crisis: technical glitches at a storage facility, a shipment of low-quality gas from abroad and unnecessary stockpiling by the public. Still, he was amazed at how quickly the crisis disappeared.“We went to sleep one night, woke up the next day, and the crisis was gone,” he said, casually sipping tea in his office with his colleagues. Regardless of the reasons behind the crisis, he said, Mr. Morsi’s rule had not helped. “No one wanted to cooperate with his people because they didn’t accept him,” he said. “Now that he is gone, they are working like they’re supposed to. In the months before the military ousted President Mohammed Morsi, Egypt’s top generals met regularly with opposition leaders, often at the Navy Officers’ Club nestled on the Nile. The message: If the opposition could put enough protesters in the streets, the military would step in—and forcibly remove the president. “It was a simple question the opposition put to the military,” said Ahmed Samih, who is close to several opposition attendees. “Will you be with us again?” The military said it would. Others familiar with the meetings described them similarly. By June 30, millions of Egyptians took to the streets, calling for Mr. Morsi to go. Three days later, the military unseated him. ..As agitation against the Muslim Brotherhood grew, the Brotherhood formally asked the Minister of Interior for protection of their offices nationwide. Gen. Mohammed Ibrahim, Minister of Interior, publicly declined.Gen. 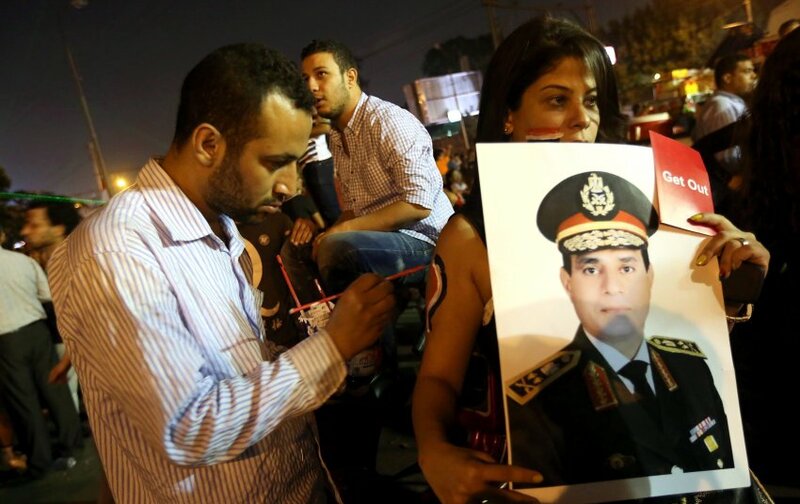 Ibrahim faced pressure from powerful figures in the former Mubarak camp. On June 24, Ahmed Shafiq—the last prime minister appointed by Mr. Mubarak and Mr. Morsi’s closest rival for president—said in a television interview that he warned the general to not show support for the Brotherhood. “I told him…the coming days will not be on your side if you do, and these days will be very soon,” Mr. Shafiq said on TV. “They will see black days,” he said, referring to the Brotherhood. Days later, Mr. Shafiq’s warning materialized. Armed young men began ransacking Muslim Brotherhood offices nationwide. However, this is only reported in few international outlets and then restricted only to newspapers. The television channels didn’t air any such report. Moreover, the local Egyptian media is so skewed towards pro-coup crowd that any thing referring to it as a coup have been blacked out by revolutionaries themselves. These are the two screenshots of live sit in being staged yesterday in Rabea Adwaya. Neither international media nor the liberal and educated tweeps considered it worth tweeting about it. Because the channels they are plugged into are ignoring it. This is around 2am in the morning. This is how the game is being played. By shutting down pro-democracy outlets and providing no coverage to them, they want to give the impression that Morsi has lost his legitimacy to rule. Nothing could be farther from truth. The massive protests of June 30 came in conjunction with a much larger scheme that began very soon after Morsi took office. This long term project by entrenched state elites seeks more than simply ejecting the Muslim Brothers from power, although that’s a highly prized outcome. 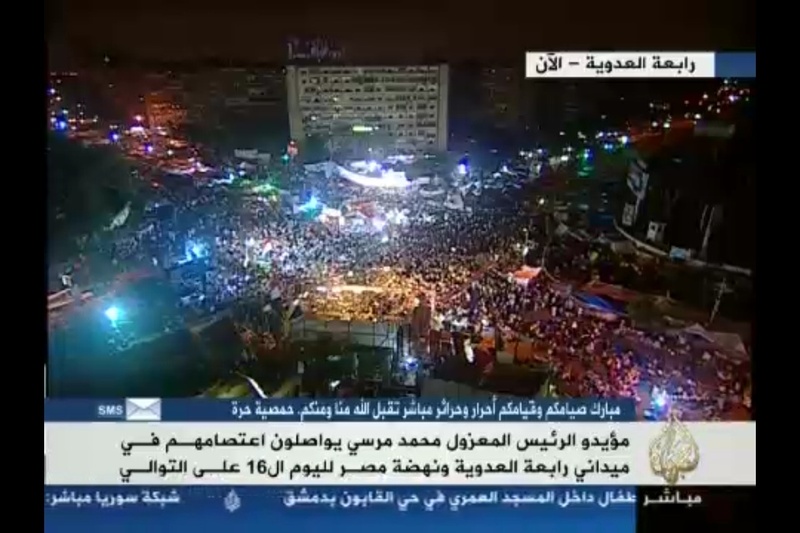 Aerial footage (only of the anti-Morsi crowds, of course) was sent to anti-Morsi television channels, which broadcast it to the tunes of triumphal cinematic music. Naturally, the protests of those icky other people didn’t exist. A military plane was put at the disposal of a film director who’s a fixture of the anti-Morsi cultural elite, presumably to make a movie about “Egypt’s second revolution,” as State TV swiftly christened the June 30 protests. The equally massive June 25 2012 protests against military rule are conveniently dropped from this emerging canonization. The next act of the pageant was to control the message. Officials enlisted media personalities to banish the term “coup” and hound anyone who used it. A few hours before General El-Sisi’s declaration of the coup on July 3, Egyptian media luminaries were contacting foreign media outlets to insist that they not call his imminent announcement a coup. Military spokesmen and anti-Morsi activists repeatedly and defensively asserted that “15 million protesters” and “30 million protesters” had come out on June 30, not citing the source of their numbers. A former police chief called the numbers “unprecedented in Egyptian history.” A giant message saying “It is not a coup” was reflected with green laser on the front of the Mugamma building in Tahrir on July 5. 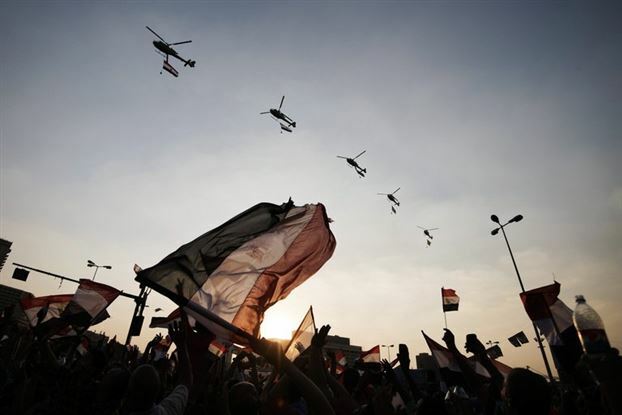 In one of the more surprising and symbolically powerful moments during Egypt’s mass protests on Sunday against President Mohamed Morsi, military helicopters circling overhead dropped Egyptian national flags on the crowds gathered in Cairo’s Tahrir Square. A video of the moment, embedded above, shows the TV journalist reporting from Tahrir visibly surprised. @2paisay The military threw leaflets yesterday warning the people to stop protesting, leave the Square and they’ll come to no harm. But this is not all. The whole narrative of 22 million signatures of Tamarod and 30 million protestors filling out Tahrir Square is wrong. However, it is repeated so many times in local media by the coup supporters that it has become part of the lore. After being irritated for over two years now by how Egyptians throw numbers around without meaning I have finally decided to prove that the daily numerical allegations in Egypt are usually false. What motivated me to do so is hearing the funniest figures ever, the 17 to 33 million protesters with regards to the events that unfolded on the 30th of June. Adding up the presence at Tahrir Square and Ittihadiya we will get a total of (378,124 + 286,602) 664,726 protesters and for the purpose of extreme generosity in figures, I will round them up to 700,000 to make up even more for circulation in both areas. Now in a simple Algebraic manner, knowing that Cairo includes over 25% of the Egyptian population, a quick extrapolation will show that Egypt as a whole wouldn’t have had more than 2.8 million protesters on the streets during the June 30 event, if not even less than these 2.8 million due to my generosity in rounding up figures like crazy. 0.25X = 700,000 protesters where X is the total number of protesters. 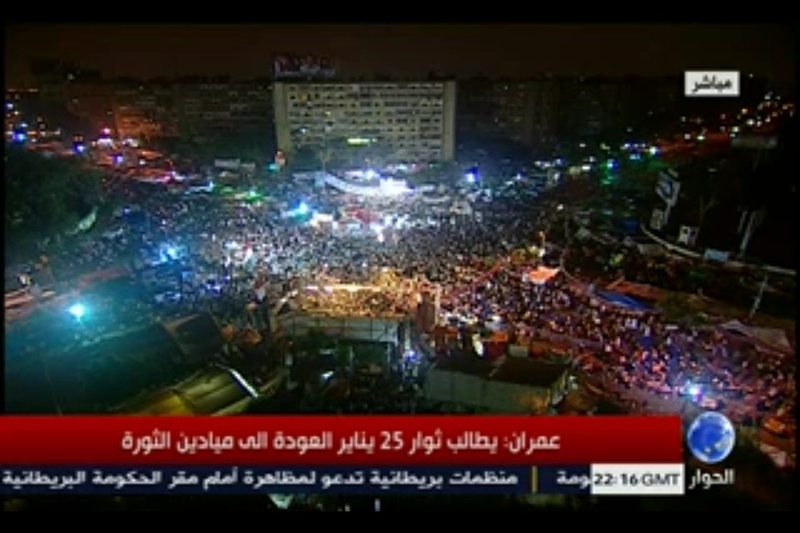 X = 700,000/0.25 = 2,800,000 protesters in Egypt as a whole. My point is this annuls the claimed legitimacy of the Tamarod (Rebel) movement, takes away their right to speak on behalf of the entirety of the Egyptian population. It also raises a big question mark around the number of the signatures they claim to have obtained. More importantly these calculations raise a claim as to how a democratically elected president was removed from office due to protests by what does not even represent 5% of the entire Egyptian population and barely represents 5% of the portion of said population that has a right to vote in Egypt. What is being lost here is that crowd is large, reaching the numbers reached on June 30 yet there is absolutely no mention of this anywhere like the coverage June 30 protests received or even the many times small Taksim protests received. The purpose of this post is to have a record for posterity as everything will be lost in the narrative and media barrage. A coup d’état is defined as a forceful seizure of executive authority and office by a dissident/opposition faction within the country’s ruling or political elites that results in a substantial change in the executive leadership and the policies of the prior regime (although not necessarily in the nature of regime authority or mode of governance). [Coups d’etat are defined as] overt attempts by the military or other elites within the state apparatus to unseat the sitting head of state using unconstitutional means…there is no minimal death threshold for defining a coup. A coup attempt is defined as successful if the coup perpetrators seize and hold power for at least seven days. The distinguishing characteristics of the coup coup d’état as a political technique are that: (a) it is the effort by a political coalition illegally to replace the existing governmental leaders by violence or the threat of violence; (b) the violence employed is usually small; (c) the number of people involved is small; (d) the participants already possess institutional bases of power within the political system. You might wonder why this argument over whether its a coup or not goes on in media. Part of the reason is that Egypt gets aid to the tune of $1.5 Billion every year from US and if it is a coup against a democratically elected government, then that aid due to the laws prevailing in US will get suspended which neither the Egyptian Army nor US wants. On a different level, calling it a “revolution” and not a “coup” makes it palatable to its supporters. America finds itself in a tight spot. After the coup, President Obama expressed “deep concern,” steering clear of any explicit condemnation. More troubling, he called for the restoration of “a” — not “the” — democratically elected government, an important distinction that won’t be lost on the Brotherhood. 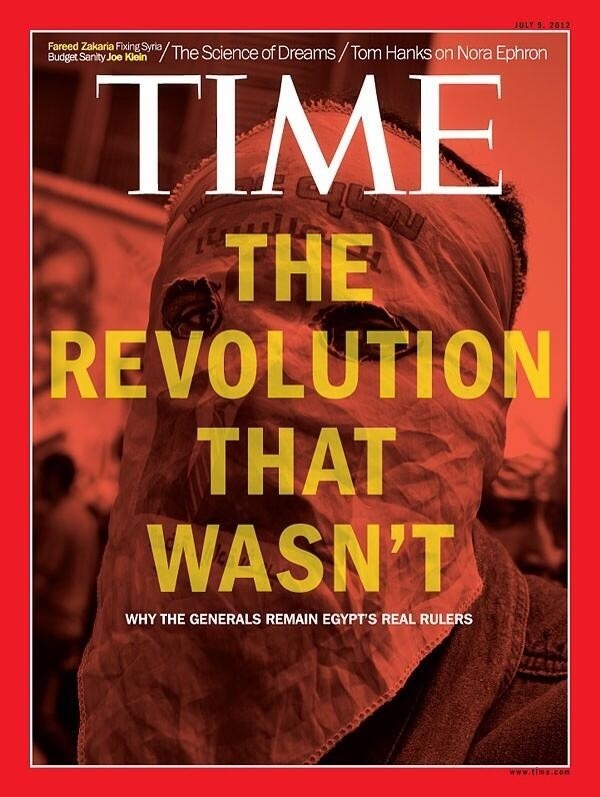 Seeing that their narrative that this is not a coup is not getting traction, pro-coup Egyptians have resorted to calling it “soft coup” or “people-power-backed military coup” as if it is something unique or happened with Egyptian for first time in history. Cairo’s secular middle class consequently had far less cause to take to the streets last weekend than did the pot-bangers in Allende’s Chile, the general strikers of Caracas or the yellow shirts of Bangkok. They can, however, expect much the same results — which will be anything but the liberal democracy they say they support. … the ultimate losers in this week’s coup will be those who cheered it on. The first freely elected government of a country, where a large fraction of society is disenfranchised, disempowered and made to feel like second-class citizens, is ousted, in the name of saving democracy, by a military coup supported by former elites and “liberals”. And the outcome? Three more military coups and more than 50 years later, a deep chasm in society that is still preventing the emergence of truly inclusive politics. 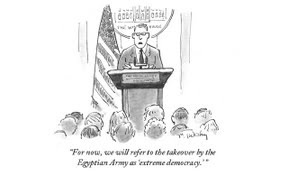 No, we are not talking about the future of Egypt (not directly in any case). …what Egypt needed was those ascended to power for the first time to peacefully lose an election — not because the other side cannot tolerate the very thought of those that have so far viewed as second-class sitting in the presidential palace but because they just messed up and weren’t governing well. Because they just lost the support of the ordinary people and had to leave the way they came, through the polls. Just like in Turkey, Egypt needed assurances to both sides that inclusive politics in which every segment of society, regardless of creed, religion, gender and social status, can share power. Instead, we have in our hands a military coup that confirms the worst fears of a very large fraction of the population — that the so-called liberal elites and the military that have ruled the country for so long will do anything not to share power with them (never mind that Mubarak and his cronies, together with the military, had also effectively sidelined the young and the liberals who have now turned into allies of the soldiers). How will this segment of society ever trust democratic politics? How can we expect them not to work to undermine their opponents completely the moment they wrestle power nationally or locally? How can we now hope to end the Egyptian iron law of oligarchy? As President Mohamed Morsi huddled in his guard’s quarters during his last hours as Egypt’s first elected leader, he received a call from an Arab foreign minister with a final offer to end a standoff with the country’s top generals, senior advisers with the president said. What is clear is that despite Patterson’s public statements underlining Mursi’s democratic legitimacy – which drew sharp criticism in Egyptian media – there was no red light from Washington against military takeover. It is not as if ouster was a surprise. In his own words, Mr. ElBaradei said that they were in touch with western powers before engaging the coup. Mohamed ElBaradei, the Nobel Prize-winning diplomat and Egypt’s most prominent liberal, said Thursday that he had worked hard to convince Western powers of what he called the necessity of forcibly ousting President Mohamed Morsi, contending that Mr. Morsi had bungled the country’s transition to an inclusive democracy. What Morsi failed to realize or appreciate that he doesn’t control the military head on in your first year. Whereas Erdogan was successful in taming military in Turkey but one has to remember that it was his third time, he is widely popular and most importantly he has distributed fruits of economic development widely thus strengthening his support base. What is clear is that military has been the real rulers of Egypt. Egyptian President Morsi has been toppled, and a judge will be the country’s new interim leader. But in reality, he’s just a puppet. Behind the scenes, General Abdel-Fattah el-Sissi and his military apparatus will continue to call the shots. Since it took power in a coup in 1952, the military has remained the most important political player in Egypt. Neither Mubarak’s fall in 2011, nor the short rule by Morsi, a member of the Muslim Brotherhood, have changed this. El-Sissi demonstrated just how powerful the influence of the military’s generals is on Wednesday night, when, after giving Morsi 48 hours to leave office, he summarily informed the president that he was no longer the leader of the country. 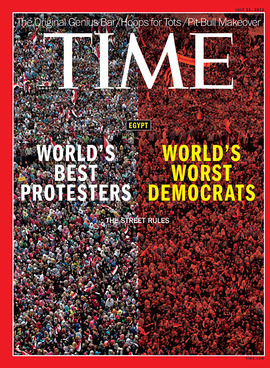 No matter that Morsi was the country’s first democratically elected head of state. This time the head of the military has been trying from the outset to stay in the background. The events of Wednesday night are clearly a coup — the army has deposed a democratically elected president and suspended the constitution. Yet Sissi acted as if the generals had been compelled by the Egyptian people to intervene. 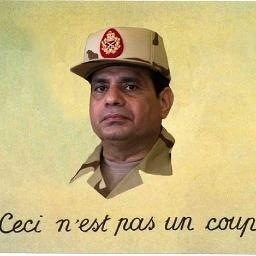 Indeed, many Egyptians have welcomed the coup. The military envisions a power-sharing setup where civilians will hold primary authority. That way, they will be the ones to draw the ire of the population as they slave away to solve the country’s disastrous economic situation and mend deep political divisions. Behind the scenes, Sissi and his colleagues set the tone, especially in two areas: Security policy is traditionally their domain, but the government should also keep clear of the generals’ monetary privileges. The army is one of the most important economic power brokers in Egypt. It remains to be seen whether this power-sharing structure will actually work. This is exactly what the military already tried in vain with the Muslim Brotherhood. But Morsi was rebellious. He began to interfere in security policy and didn’t take the sharp warnings of the generals seriously. From their perspective, things will work out better this time under the duo of military chief and top judiciary. “The Egyptian army’s history is very much defined in relation to the Arab-Israeli conflict,” says Nezar Al-Sayyad, the chair of UC-Berkeley’s Center for Middle Eastern Studies. Under the charismatic and popular Nasser, the Egyptian Army sought to rebuild itself into a competent fighting force. It didn’t go well. After a costly expeditionary campaign supporting Arab republican forces in Yemen’s civil war, Nasser led a second Arab coalition against Israel during the Six Day War of 1967. His forces suffered a spectacular defeat, losing the the entire Sinai peninsula—which Egypt had controlled—to Israeli forces. The win destroyed the myth of Israeli invincibility and restored the reputation of the Egyptian army as a fighting force and defender of the nation’s interests. After Mubarak, a former general, took power following Sadat’s assassination in 1981, the military, backed by American aid, modernized and expanded its force. And when Mubarak launched economic liberalization in the 1990s, the military discovered something even better than American largesse: capitalism. The armed forces’ public-private enterprises may account for up to 15 to 20 percent of GDP, according to Al-Sayyed, and the military took very good care of its officers with the wealth it accrued. As the military’s economic tentacles spread throughout society, its civil clout expanded, too. During the massive protests that led to Mubarak’s ouster, the military—after a period of initial silence—publicly stated that its duty was above all to the people of Egypt, and soon wrested control from the 80-year-old autocrat. The military seemed to recognize the fickle nature of voters in the drafting of Egypt’s 2012 constitution, ensuring that its privileges and powers were cemented in the new document. @jstacher@blakehounshell@arabist@aymanm The petrol “crisis” that’s suddenly over is so obvious even the taxi drivers are suspicious. Mansour held talks on Saturday with the army chief and political leaders, including ElBaradei, on how to pull the country out of crisis as the death toll from Islamist protests over the army’s overthrow of Mursi rose to at least 35. Mansour later summoned ElBaradei back to the presidential palace, the state news agency reported, without giving more details. The prime minister will be sworn in at 8 p.m. (2:00 p.m. EDT), state newspaper Al-Ahram reported, not naming who will be sworn in. 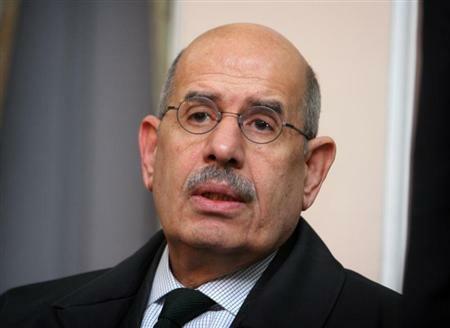 ElBaradei’s nomination had been confirmed by several sources and state media on Saturday, but just before midnight a presidential spokesman told reporters that the prime minister had not in fact been chosen. The abrupt U-turn came amid opposition to the appointment by the Nour Party, Egypt’s second Islamist force after Mursi’s Muslim Brotherhood movement, highlighting the challenge the military faces in finding consensus among liberals and conservatives on who should run the country. How to spot a lying Dictator? It’s the percentages, stupid. A lot of numbers are flying around in the media nowadays. Opinions have become polarized on every subject after financial crisis, Arab Spring, War on Terror etc. To give weight to their arguments, opinion makers quote made up (or so it seems) statistics to give credibility to their side of the story. 98.94% approval rating and 72.56% turnout. Now where have I seen such numbers and referendum on such unilaterally proposed reforms before? There are no points for guessing that Pakistan would be the correct answer. We have a history of holding such referendums by military dictators. In 1960, he held an indirect referendum of his term in power. Functioning as a kind of electoral college, close to 80,000 recently elected village councilmen were allowed to vote yes or no to the question: “Have you confidence in the President, Field Marshal Mohammed Ayub Khan, Hilal-i-Jurat?” Winning 95.6% of the vote, he used the confirmation as impetus to formalise his new system. Whether the people of Pakistan endorse the process initiated by General Muhammad Zia-ul-Haq, the President of Pakistan, for bringing the laws of Pakistan in conformity with the injunctions of Islam as laid down in the Holy Quran and Sunnah of the Holy Prophet (PBUH) and for the preservation of the Islamic ideology of Pakistan, for the continuation and consolidation of that process, and for the smooth and orderly transfer of power to the elected representatives of the people. It was reportedly approved by 98.5% of voters, with a turnout of 62.2%. For the survival of the local government system, establishment of democracy, continuity of reforms, end to sectarianism and extremism, and to fulfill the vision of Quaid-i-Azam, would you like to elect President General Pervez Musharraf as President of Pakistan for five years? According to the Government there were 78 million eligible voters. Eighty seven thousand polling stations were set up, including booths set up at prisons, hospitals, petrol stations, workplaces, and markets. However, there were no voter lists or constituencies, and anyone who could prove his identity and age could vote at any polling station. According to the Government estimate, around 98 percent of the counted votes backed General Musharraf continuing in office and the turnout of the referendum was said to be around 70 percent. What’s with the obsession of dictators with approval ratings reaching almost 100%? And when voter turnout has normally been less than 50%, how come voter turnout in referendums reach 70%? Don’t they know that this puts the credibility of the results into question. Once these usurpers have legitimized their rule for the said period promising reforms, it turns out that by the time they leave (rather “forced to leave”) and take their reforms with them, the country is worse off compared to when they took over. Based on this history, I will give King Mohamed VI of Morocco a maximum of 10 years of sham reform before he is booted out or is restricted to his palace. Whereas these dictators create an infrastructure of polling/votes before quoting statistics, we have an Interior Minister who has taken to quoting percentages like a magician creating them out of thin air at his whims. But that is for another post. Couple of months ago I found out that there is an opening in a multinational company in Karachi in the area of finance for the position of Manager/Director. I asked my friend who knew the present director to forward my CV. He called me up today saying that they have informed him that I am ‘too hi-fi’ for the position. I said I want to come back home and would happily come at a lower salary and reduced my asking salary to around Rs. 2 lacs. His reply was that the salary you are asking is not an issue. “Then what is the issue?” I asked. They say you are a high flyer_specifically mentioning my foreign qualification. I was dumb founded. I would have preferred an excuse like “Istikharay mein naam nahin aaya”. I would even have accepted that my experience does not fit the job description. I grew up as a member of middle class society. There were certain organizations especially multinationals that preferred that their employees especially in upper cadres belong to certain areas i.e., defence, clifton, PECHS and look down upon people living in middle class or lower class areas. I have seen prospects of growth improving for people considerably once they have moved from North Karachi to Defence. I did not or could not move to Defence but supplemented my education with a foreign degree from one of the better known institutions hoping to improve my prospects. I did not realize that the same qualification would become a handicap. I have heard stories about people being told in interviews that they are overqualified for the position but this was a multinational and my background perfectly suited the role. Some time ago, I had forwarded my CV to the local central bank. The HR head, according to my friend who works there, commented that “this is one of the better CVs I have seen in my career. However, the guy does not have a central banking experience.” Would someone ask him how many central banks are there in a country so that one could gain experience at one before applying to the other? There was a time when before applying for a position, I would consider whether I am under-qualified for the position. Now I have to consider otherwise. PS: This is not a complaint. Just some observations.